Half way down the famed Flemington straight, the good-looking bay still had several lengths to make up. Supporters of the short-priced favourite were feeling a bit nervous, especially as the leader gave a nice little kick. But the bay changed legs, pinned his ears back and lengthened his impressive stride – and the horse considered by many to be the good thing of the day was in front where it counted, putting his nose out on the line. It was just start number four for the exciting Greg Eurell trained three-year-old O’Tauto who had created such a fine impression saluting in determined fashion at his Cranbourne debut last winter. 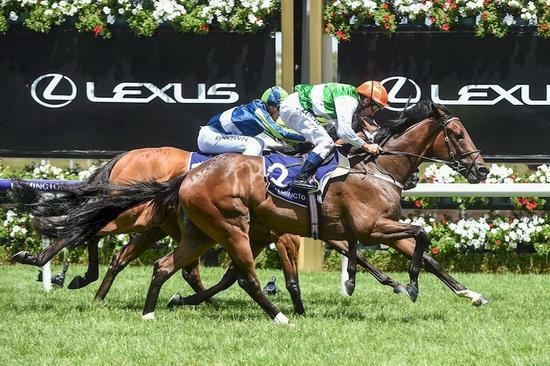 Going close stepping straight up to BM70 level at Flemington next time out, O’Tauto was given to mature and – having caught the eye with a gallant second at that same track first up – it was little wonder that he was so strongly fancied in Saturday’s Furlong Bar Handicap. Settling back in a race not really run to suit, O’Tauto did a fair bit wrong – at different times in the race wanting to get on the bit, then off it – then on again… “at first he settled beautifully,” Damien Oliver reported, noting that at other times he was inclined to want to charge a bit. And then into the straight O’Tauto was a little too relaxed with plenty to do – but when asked for his effort he found in the style of a good horse. Proud owner/breeder Neville Murdoch of Larneuk Stud – home to O’Tauto’s much undervalued sire O’Lonhro – has been excited by the young horse from very early days. “He was a nice foal who has always had that bit of presence,” he said. Of course, there is a lovely race over that very trip coming up – the Australian Guineas one possibility for O’Tauto; a race won by his great great grandsire Zabeel back in 1990! Eurell said, adding that O’Tauto will be all the better as he matures; “he is going to grow into a lovely four-year-old,” he said. The third winner in two days for O’Lonhro (the consistent performers Moving On Up and Mr Bellagio both successful on Friday, O’Tauto is the first Larneuk Stud bred foal for the lightly raced winning Strategic mare Taut. Having noticed that O’Lonhro’s sire Lonhro was doing a good job with mares by Night Shift, Murdoch was keen to secure Taut whose dam is by that well related stallion. And it took only $800 to make her part of the Larneuk Stud broodmare band! Having produced lovely fillies by O’Lonhro’s past and present stud-mates Ilovethiscity and Cluster, Taut is back in foal to O’Lonhro who Murdoch continues to support with such nice mares as Faiza (Gr.3 Blue Diamond Prelude) as well as the multiple city winners Flying Empress and Go Missy. “O’Lonhro continues to do the job despite limited opportunities,” Murdoch said, always proud of the achievements of one of his favourite stallions. For further information on O’Lonhro who stands alongside Cluster, Honorius and Wolf Cry contact Neville Murdoch on 0418 105 706 or visit www.larneuk.com.